AKI in pregnancy remains a cause of significant fetomaternal mortality and morbidity, particularly in developing countries. Hypertensive complications of pregnancy (preeclampsia/eclampsia or hemolysis, elevated liver enzymes, and low platelets count syndrome) are the leading cause of AKI in pregnancy worldwide. Thrombotic microangiopathy is another peculiar and devastating cause of AKI in pregnancy. During the last decade, our understanding, and in some cases, our management, of these causes of AKI in pregnancy has dramatically improved. For instance, convincing data have linked pre-eclampsia/eclampsia to an increase in circulating antiangiogenic factors soluble Flt 1 and endoglin, which induce endothelial cell dysfunction, hypertension, and proteinuria. Several distinct pathogenic mechanisms underlying thrombotic microangiopathy, including thrombotic microangiopathy occurring during pregnancy, have been established. Thrombotic microangiopathy, which can present as hemolytic uremic syndrome or thrombotic thrombocytopenic purpura, can be reclassified in four potentially overlapping subtypes: disintegrin and metalloproteinase with a thrombospondin type 1 motif, member 13 deficiency-related thrombotic microangiopathy, complement alternative pathway dysregulation-related thrombotic microangiopathy, secondary thrombotic microangiopathy (verotoxin and antiangiogenic drugs), and thrombotic microangiopathy of undetermined mechanism. In most cases, pregnancy is only a precipitating factor for thrombotic microangiopathy. Treatment of thrombotic microangiopathy occurring during pregnancy should be tailored to the underlying pathogenic mechanism: (1) restoration of a disintegrin and metalloproteinase with a thrombospondin type 1 motif, member 13 serum activity in the setting of thrombotic thrombocytopenic purpura through plasma exchanges and in some cases, B cell-depleting therapy and (2) inhibition of complement alternative pathway activation in atypical hemolytic uremic syndrome using antiC5 blocking antibody (eculizumab). AKI in pregnancy (P-AKI) remains a cause of significant fetomaternal mortality and morbidity. Its definition, and hence, its incidence, varies widely in published studies from mild increase in serum creatinine >0.8 mg/dl to dialysis requirement (1,2). However, serum creatinine level decreases during normal pregnancy mainly because of the combination of blood volume expansion, hyperfiltration, and oncotic pressure decrease, and it reaches levels around 0.6–0.7 mg/dl during the third trimester. Thus, in some cases, a moderate increase in serum creatinine above 0.7–0.8 mg/dl may already reflect P-AKI if prerenal causes (mainly dehydration) of serum creatinine increase have been carefully excluded. However, the increase in serum creatinine may be a late event in the course of P-AKI. Hypertension and edema may herald the onset the P-AKI, and old (serum uric acid and proteinuria) or new currently evaluated (neutrophil gelatinase-associated lipocalin) (3) biologic markers may help predict the occurrence of AKI in pregnant women. The incidence of P-AKI has decreased in developed countries over the last three decades, prompting some authors to wonder whether this entity has disappeared in these countries (4). Based on data from an Italian study from the 1990s (4), the current incidence of P-AKI in developed countries is estimated around 1 in 20,000 pregnancies. The decrease in the incidence of P-AKI is mainly because of the near disappearance of postabortum sepsis after the legalization of abortion in most developed countries and the improved management of hypertensive complication of pregnancy. In contrast, the incidence of P-AKI remains unacceptably high in developing countries. In a recent study from India (1), P-AKI occurred in roughly 1 in 50 pregnancies and represented up to 20% of all cases of AKI. It was associated with a high incidence of fetal/neonatal (39%) and maternal (20%) mortality. The specific factors leading to the persistent high incidence of P-AKI in developing countries include septic abortions usually performed in the absence of adequate medical monitoring, overall poor follow-up of pregnancy with limited screening of hypertensive complications of pregnancy, and relatively late referral of patients with these disorders. However, the incidence of P-AKI is declining even in developing countries (5,6). In a recent survey of P-AKI in an Indian nephrology center, the prevalence of P-AKI among all cases of AKI decreased from 15% in the 1980s to 10% in the 1990s. However, the prevalence of P-AKI remains unacceptably high, and specific measures for the prevention and management of sepsis and hypertensive complications in pregnant women are required to reduce the burden of P-AKI in developing countries. One of the most severe complications of P-AKI is renal cortical necrosis (RCN), which consists of a patchy or diffuse ischemic destruction of the renal cortex. It occurs in 1.5%–2% of all cases of AKI in developed countries and more frequently (3%–7%) in developing countries (7,8). Obstetric complications (septic abortions, placental abruption, and intravascular disseminated coagulation) are the main cause of RCN (50%–70%) in developing countries (6,9). The peculiar frequent association of RCN and pregnancy remains poorly understood. However, for P-AKI, the overall incidence of RCN in P-AKI cases in developing countries has decreased from 20%–30% to 5% in the last two decades (6). P-AKI occurs mainly (up to three of four cases) during the late third trimester and around delivery. In most countries, including developing countries, hypertensive complications of pregnancy are currently the leading cause of P-AKI (10). Other causes include postabortum (first trimester) or puerperal sepsis, ante- or postpartum hemorrhage, intrauterine death, acute fatty liver, and thrombotic microangiopathy (TMA). The main causes of P-AKI are shown in Figure 1 according to their predominant timing of occurrence during pregnancy. For most causes of P-AKI, pregnancy and its complications (hypertensive complications, intrauterine death, and hemorrhage) play a predominant primary role in the genesis of P-AKI. In contrast, for some other causes of P-AKI such as the various forms of pregnancy-related TMA, pregnancy is only a trigger for AKI that is mediated mainly by constitutional genetic risk factors. Main causes of pregnancy-related AKI depending on their predominant timing of occurrence during pregnancy. CAP, complement alternative pathway; DIVC, disseminated intravascular coagulation; PE/E, pre-eclampsia/eclampsia; TMA, thrombotic microangiopathy. In this short review, we will focus on hypertensive complications of pregnancy [pre-eclampsia (PE), eclampsia, and the hemolysis, elevated liver enzymes, and low platelets count (HELLP) syndrome] and TMA as causes of P-AKI. PE, which affects 2%–7% of pregnant women (11), is defined by the association of hypertension (BP>140/90 mmHg) and proteinuria (>300 mg/d) after 20 weeks of gestation. PE occurs mainly during the late second and third trimester, but it may occur up to the time of delivery and even postpartum. Severe forms of PE may be complicated by eclampsia (E; seizures) and the HELLP syndrome. The renal lesion of PE is characterized by glomerular endothelial cell swelling and detachment, leading to capillary lumen obstruction in the occurrence of subendothelial deposits (12). These lesions usually recover starting in early postpartum, and in most but not all cases, they completely disappear by 3–6 months postpartum with the parallel resolution of proteinuria and hypertension. PE/E accounts for 15%–20% of P-AKI cases (13), and the risk of P-AKI is higher in the setting of early-onset (<32 weeks gestation) PE/E (2). Convincing data have linked the pathophysiologic changes observed in PE to an increase in the circulating antiangiogenic factors sFlt 1 and endoglin. It is hypothesized that increased sFlt 1 effectively reduces the concentration/activity of vascular endothelial growth factor (VEGF), resulting in endothelial cell dysfunction, hypertension, and proteinuria (14–16). Interestingly, coadministration of endoglin and sFlt1 to pregnant rats leads to renal pathologic lesions (i.e., glomerular endotheliosis) similar to those lesions noted in patients with PE/E and AKI (14). Nevertheless, it remains unknown why such an increase in serum levels of antiangiogenic factors occurs in a subset of pregnant patients who ultimately develop PE. The antiangiogenic state that characterizes PE may represent a common pathogenic consequence of different upstream mechanisms that include placental hypoxia (17,18), immune dysregulation (complement and natural killer cells) leading to an impaired maternal tolerance to fetal antigens (19,20), circulating angiotensin receptor AT1 activating autoantibodies (21), and increased release of oxidative stress products in the placenta (22). TMA is defined by the occurrence of thrombi of fibrin and/or platelets in the microvasculature (arterioles and capillaries) of various organs, mainly the kidney and brain. Other pathologic features of TMA include endothelial cell swelling, accumulation of protein and cell debris in the subendothelial layer, and in some cases, splitting of the glomerular basement membrane (double contours) (23). TMA affecting mainly the kidney is usually called hemolytic uremic syndrome (HUS), which includes various subtypes: verotoxin-associated typical (diarrhea+) HUS, secondary HUS (for example, pregnancy-associated HUS) (24), and idiopathic atypical HUS (aHUS) (25). TMA characterized by profound thrombocytopenia and in some cases, neurologic disturbances is usually termed thrombotic thrombocytopenic purpura (TTP). However, the two entities clearly overlap: 10% of TTP patients have significant AKI (26), and neurologic involvement is not infrequent in typical HUS or aHUS (27–29). During the last decade, our understanding of the pathogenesis of HUS and TTP has dramatically improved. On one hand, some forms of TTP are caused by an acquired (inhibitory antibodies) or more rarely, constitutional deficiency in ADAMTS13 (a disintegrin and metalloproteinase with a thrombospondin type 1 motif, member 13), a metalloprotease that cleaves the ultralarge multimers of von Willebrand factor (vWF). vWFs are potent inducers of platelets aggregation (30). In the setting of ADAMTS13 deficiency, ultralarge vWF multimers persist in the circulation and initiate thrombi formation with ensuing TMA. On the other hand, most cases of aHUS arise from a dysregulation of the complement alternative C3 convertase, and uncontrolled activation leads to complement-induced endothelial damage that promotes TMA (25,31). Dysregulation of the complement alternative pathway (CAP) may derive from inactivating mutations in the genes coding for the three main inhibitory factors of CAP: factor H (FH), FI, and membrane-cofactor protein (32). More rarely (6%–10% of cases), acquired inhibitory autoantibodies lead to FH deficiency, mainly in children (33). Similarly, gain of function mutations in the genes coding for the two main components of the alternative C3 convertase, C3 (24,34) and FB, lead to the generation of a superactive alternative C3 convertase with reduced sensitivity to inhibitory factors. Abnormalities in complement genes and anti-FH antibodies account for 60%–80% of all cases of aHUS. Additionally, accumulating data underline that complement dysregulation is involved in the pathogenesis of secondary forms of HUS (postrenal transplantation de novo HUS) (35) and even in typical verotoxin-induced HUS (28,36). However, the penetration of complement dysregulation-associated aHUS is approximately 50%, and complement genes abnormalities represent only risk factors for the occurrence of aHUS (25). Other genetic and nongenetic factors are most probably required for the occurrence of aHUS, such as associated at-risk polymorphisms in the various complement genes and precipitating events such as infections and pregnancy. These breakthroughs in the pathogenesis of TMA have led to a reclassification of this disorder based on the underlying pathogenic mechanism (25), complement dysregulation TMA, ADAMTS13-deficient TMA, and TMA linked to other mechanisms (verotoxin and VEGF deficiency), with a clear overlap between all these forms of TMA. Additionally, new mechanisms of TMA are increasingly recognized, such as VEGF deficiency (37). However, the mechanisms of some forms of TMA remain elusive. This classification is more helpful than the terms HUS and TTP for choosing the appropriate treatment for a given patient. For instance, treatment of ADAMTS13-deficient TMA should aim to restore a significant (>10%) enzymatic activity through clearance of inhibitory antibodies using plasma exchanges. In plasma-resistant or dependant forms, rituximab, a B cell depleting monoclonal antibody, is most probably the optimal treatment, which was underlined by several studies (38,39). Rituximab improves the short-term outcome of severe ADAMTS13-deficient TMA with reduced hospital stay, plasma exchange requirement, and relapse rate (39). However, its impact on the long-term outcome of the disease warrants additional assessment. In contrast, treatment of complement dysregulation TMA should aim to rapidly inhibit complement cascade activation, and complement modulators are emerging as promising therapies for this subtype of TMA. How does this apply to pregnancy-associated TMA (P-TMA)? P-TMA is considered a secondary form of TMA. It accounts for 8%–18% of all cases of TMA (24,26,40,41). In the French aHUS registry, one of five women presented with aHUS at the time of pregnancy (24). P-TMA still carries a high morbidity and mortality (up to 10%) rates (42). Similar to other types of TMA, P-TMA may be associated with ADAMTS13 deficiency, complement dysregulation, or unknown mechanisms. ADAMTS13 deficiency-related P-TMA occurs mainly during the second and third trimesters of pregnancy. Among 23 published reports of ADAMTS13 deficiency-related TMA triggered by pregnancy, 83% of cases occurred during the second and third trimesters of pregnancy (reviewed in ref. 24). This finding may be because of the progressive decrease in ADAMTS13 and the parallel increase in vWF antigen during normal pregnancy (43). ADAMTS13 activity to vWF antigen ratio reaches a nadir during the second and third trimesters, which probably potentiates the inhibitory effect of anti-ADAMTS13 autoantibodies, leading to TMA. Treatment of ADAMTS13 deficiency-related P-TMA aims to restore a significant enzymatic activity through clearance of autoantibodies using plasma exchanges or fresh frozen plasma infusions in case of constitutional ADAMTS13 deficiency. Corticosteroids are usually used as an adjunctive treatment for ADAMTS13 deficiency-related TMA or other forms of TTP. However, there is no definitive evidence of the efficiency of steroids in this setting. Plasma exchanges or fresh frozen plasma infusions may fail to induce or maintain TMA remission, particularly in the presence of high-titer inhibitory autoantibodies (26). As already outlined, the B cell-depleting antibody rituximab is probably the optimal second-line therapy. However, the use of rituximab during pregnancy raises the issue of its potential fetal toxicity. Like all IgG1 antibodies, rituximab undergoes an active transplancental transport through Fc receptors mainly during the third trimester of pregnancy, leading to the drug accumulation in the fetus. Rituximab is usually cleared from the newborn circulation within 3–4 months postpartum (44). In a recent review of 153 pregnancies in women with malignant hemopathies or severe systemic disorders treated with rituximab during gestation (45), 60% live births, 21% first-trimester abortions, and 2.2% congenital abnormalities were reported. Thrombocytopenia, neutropenia, and B cell depletion were noted in <10% of the neonates, but the incidence of these complications in neonates is clearly underestimated in this retrospective study. No clear conclusions can be drawn in this highly selected population. Moreover, although the short-term outcome of these infants seems rather good (45,46), the long-term impact of rituximab on the immune system of neonates exposed to rituximab during fetal life remains to be assessed. The Food and Drug Administration has given rituximab a pregnancy label C, and its use during pregnancy should be decided on a case by case basis depending on the potential benefits and risks of such treatment. The other clinical challenge is in the case of patients with known acquired or constitutional ADAMTS13 deficiency who start a pregnancy while in TMA remission. ADAMTS13 deficiency is associated with an overall risk of TMA relapse around 30% (26,39). The estimation of the risk of TTP relapse specifically during pregnancy varies widely from 23% to 50% (47,48). This discrepancy may be caused by a possible bias in the selective publication of severe cases and the heterogeneity of patients included in small retrospective series. The management of these patients during pregnancy remains ill-codified. For instance, the usefulness of the monitoring of ADAMTS13 activity and/or autoantibodies titer in patients with acquired ADAMTS13 deficiency is still a matter of debate, most particularly during pregnancy. Preliminary data suggest that the monitoring of ADAMTS13 levels during pregnancy may help identify patients at high risk of TMA relapse (49,50). Some authors have even advocated the use, early in pregnancy, of plasma exchanges in pregnant women with ADAMTS13 deficiency to maintain an enzymatic activity >10% (50). However, there are no sufficient data for the establishment of clear evidence-based guidelines for a prophylactic treatment of ADAMTS13 deficiency TMA during pregnancy. P-TMA may also be associated with alternative C3 convertase dysregulation. In a recent review of 21 pregnant aHUS (P-aHUS) cases from the French aHUS registry (24), 80% of patients had abnormal CAP dysregulation. 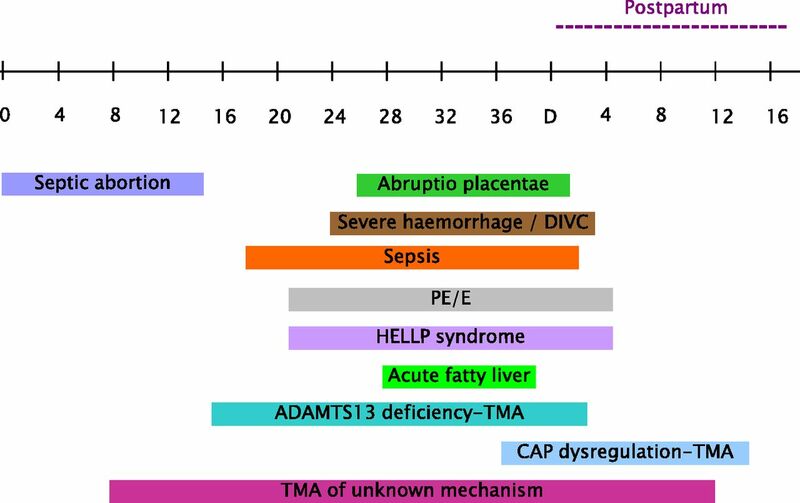 In contrast to ADAMTS13 deficiency-related TMA, P-TMA caused by CAP dysregulation occurred mainly (80% of cases) during the postpartum period. Infections and bleeding, which frequently complicate the postpartum, may trigger complement activation leading to TMA. Interestingly, P-aHUS and non–P-aHUS cases shared the same risk factors and outcome: 80% of patients in each group had CAP dysregulation with FH and FI encoding gene (CFH and CFI, respectively) mutations accounting for more than one-half of the cases. Similarly, 50% and 80% of patients in each group reached ESRD during the first aHUS episode or last follow-up, respectively. Thus, P-aHUS is most probably a complement dysregulation-associated TMA precipitated by pregnancy. The counseling of patients with complement genes abnormalities who wish to start a pregnancy remains a difficult issue. In our previous study (24), we have provided a crude assessment, based on retrospective data, of the risk of P-aHUS according to the underlying complement gene abnormality; this risk was highest (20%–30%) for patients with CFH and C3 mutations and lower (10%–15%) for those patients with CFI and membrane-cofactor protein mutations. The counseling of young asymptomatic female relatives of aHUS index cases who question the risk of P-TMA is even more complex. Screening for complement genes mutations in asymptomatic individuals is usually not performed because of the relatively low penetration of the disease, the uncertainties regarding some complement genes mutations, and the unpredictability of TMA-triggering factors. However, pregnancy is a relatively predictable, and in some cases, planned event that may potentially trigger TMA. Thus, the screening for complement genes mutations in asymptomatic female relatives of a case index may be discussed on a case by case basis for the counseling of these patients before a pregnancy. Complement dysregulation is clearly not a contraindication for pregnancy, but genetic testing may help clinicians in the counseling of these patients regarding their potential risk of P-TMA. Treatment of complement dysregulation P-TMA, like any complement dysregulation TMA, should aim at the inhibition of complement activation. The usual treatment relies on plasma therapy, mainly plasma exchanges. They are supposed to remove the dysfunctional complement cascade component and supply normal CAP regulatory factors. However, whether PE effectively increases the level of functional complement regulators has not been accurately assessed. Moreover, current criteria used for the assessment of aHUS responsiveness to plasma therapy may not be optimal. For instance, the current definition of aHUS resistance to plasma therapy is based mainly on the absence of platelets count increase and/or lactate dehydrogenase level decrease despite three to five daily plasma exchanges. This definition does not take into account the fact that platelets count increase does not always correlate with renal function improvement in aHUS patients. We believe that the absence of a significant decrease (>25%) of serum creatinine despite three to five plasma exchanges should also be used as a criteria for plasma resistance in the setting of aHUS. In all cases, plasma therapy fails to rescue renal function in roughly 50% of patients experiencing their first aHUS episode (41) (particularly those episodes associated with CFH and CFI mutations) and 80% of P-aHUS cases (24). Currently, the most potent and only clinically available efficient tool for the inhibition of complement activation is eculizumab. Eculizumab is a monoclonal humanized IgG that inhibits the cleavage of C5 and thus, prevents the generation of C5a, a powerful anaphylatoxin, and C5b, which initiates the formation of the membrane attack complex (51,52). Thus, eculizumab blocks the common terminal activation step of all three complement pathways. Eculizumab was approved initially in the management of paroxysmal nocturnal hemoglobinuria (53) and has been recently approved by the Food and Drug Administration and European regulatory organizations for the treatment of aHUS. Several case reports have underlined its efficiency in the treatment of aHUS affecting the native kidneys or the renal graft and even in the management of severe typical HUS cases (28,54–59). At least three open-label prospective industry-sponsored studies assessing the use of eculizumab in adult patients with aHUS have been conducted, and their results have been published in part in abstracts. Additionally, available data suggest that eculizumab efficiency is not affected by the presence or absence of documented complement genes mutations. Based on the available data, eculizumab is most probably the optimal first-line therapy for aHUS, regardless of the presence or absence of underlying documented complement dysregulation. However, because of economic issues (the annual cost of eculizumab treatment is around $500,000 per patient), its use may vary in different countries and institutions. In postpartum TMA, eculizumab should be considered early in the treatment strategy, because its early use probably improves renal recovery. The standard eculizumab regimen includes four weekly 900-mg infusions followed by 1,200-mg infusions every fortnight. This regimen is similar to the regimen used in paroxysmal nocturnal hemoglobinuria. However, aHUS is a more acute and rapidly devastating disease compared with PNH. Higher doses and/or more frequent eculizumab infusions may be required in some aHUS patients to achieve rapid and complete complement inhibition (unpublished observations). C5 inhibition can be easily monitored using total complement hemolytic assay. A total hemolytic assay >20% clearly indicates an incomplete and suboptimal complement inhibition. After aHUS remission has been achieved (normalization of platelet count and lactate dehydrogenase level and decrease by at least 25% of serum creatinine), the duration of maintenance treatment with eculizumab remains a matter of debate. The potential fetotoxicity of eculizumab is usually not a concern in P-aHUS, because it most frequently occurs after delivery. Nonetheless, preliminary data from HPN patients treated with eculizumab during pregnancy suggest that its use may be safe, at least in the short term, for the fetus (60–62). In contrast, potential infectious complications may be of concern. C5 inhibition increases the risk of infections with meningococcus. Thus, antimeningococcal vaccine should be administered before the start of eculizumab. Because these vaccines do not protect against all types of meningococcus, oral antibioprophylaxis should be maintained during the entire period of eculizumab treatment. HELLP Syndrome: TMA or Not TMA? HELLP syndrome is a leading cause of P-AKI. AKI occurs in 3%–15% of cases of HELLP syndrome, and HELLP syndrome accounts for 40% of all cases of P-AKI and up to 60% of severe cases (13,63–65). AKI associated with HELLP syndrome, even in its severe forms requiring dialysis, usually retains a favorable renal outcome. Most patients (93%–100%) are usually discharged without any significant residual renal impairment (63,66,67). Less than 10% of patients, particularly those patients with pre-existing hypertension and/or renal disease, progress to CKD (66). HELLP syndrome is considered to be a TMA-like disorder based on several similarities between the two disorders: mechanical hemolysis, thrombocytopenia, and AKI. These similarities explain the overlap between HELLP syndrome, TMA, and PE/E in their clinical and biologic presentation, especially in near-term pregnant patients. However, kidney biopsy in patients with HELLP-associated AKI rarely (15%) discloses typical features of TMA (reviewed in ref. 68). The most common lesions in these patients are glomerular endotheliosis, similar to the lesions in PE and acute tubular necrosis. The usual complete resolution of these two types of renal damage may explain the overall favorable renal outcome in these patients. These findings raise the question of whether the HELLP syndrome is a TMA. As far as it concerns the liver, HELLP syndrome is a TMA. Features suggestive of TMA, such as fibrin thrombi formation and ensuing periportal hemorrhage, have been documented in liver biopsies performed in patients with HELLP syndrome (69). More interestingly, some forms of HELLP syndrome share a common genetic risk factor of CAP dysregulation with aHUS. In our original series (34) of 11 patients with HELLP syndrome and relatively significant renal involvement, 4 patients had complement gene mutations, and 3 patients had stigmates of CAP activation (low C3 and factor B serum levels) without documented complement genes mutations. These findings remain to be confirmed in a larger series that includes patients with HELLP syndrome with or without significant renal involvement. The question whether HELLP syndrome is a TMA is not merely rhetorical but may have practical implications for the management of patients with severe forms of HELLP syndrome. The treatment of severe HELLP syndrome remains controversial. Steroids and plasma exchanges have been used in the absence of any clear rationale or established efficacy (70,71). If the link between HELLP syndrome and complement dysregulation is confirmed, complement inhibition may represent a potential treatment for severe HELLP syndrome. In the last decade, accumulating and converging data have suggested that CAP dysregulation/activation may be involved in the pathogenesis of pregnancy complications beyond aHUS. CAP dysregulation has been recently linked to autoimmune (lupus/antiphospholipid syndrome-associated PE) and nonimmune PE (72), and complement blockade alleviates PE features in a murine model (73). Additionally, several previous studies have underlined the implication of complement activation in the antiphospholipid syndrome-associated obstetrical complications (74,75). Thus, P-aHUS may be only the emerging tip of a larger spectrum of pregnancy disorders linked to complement dysregulation/activation. These accumulating data may prove crucial for the management of these disorders, because complement activation modulators are and will be increasingly clinically available in the next decade. In all, the incidence of P-AKI has probably decreased, but its fetal and maternal morbidity remain unacceptably high, even in developed countries. Pregnancy hypertensive complications, notably HELLP syndrome, are the leading cause of P-AKI. P-TMA is a clinically challenging cause of P-AKI. Several breakthroughs in the dissection of different mechanisms underlying P-TMA have led to a better management of these patients. F.F. has served as a consultant for Alexion. V.F.-B. is a member of several national and international atypical hemolytic uremic syndrome experts’ panels. F.F. and V.F.-B. received financial support from Alexion.